Although it has been prominent in the churches in which the majority of Christians have been enrolled, monasticism was unknown in the first two centuries of Christianity. Later generations believed that they found commands and precedent for the ascetic life in the teachings and example of Jesus and in other writings in the New Testament, but the accuracy of their interpretation is at least open to question. To be sure, Jesus declared that he who would become his disciple must surrender all that he had, in one notable instance commanded a wealthy young man to sell all that he possessed and give to the poor, and by saying that there were some who had made themselves eunuchs for the kingdom of heaven's sake appeared to commend celibacy; Yet, in marked contrast with John the Baptist, who was clearly an ascetic, Jesus, as he himself remarked, came both "eating and drinking" and neither he nor his disciples fasted during his lifetime. His leading disciple, Peter, and some others of the apostles, even after the resurrection continued to live with their wives. Paul, who favoured celibacy, knew of no express command from Jesus to support him in it and said in effect that matrimony might be as much a gift of God as the unmarried state. 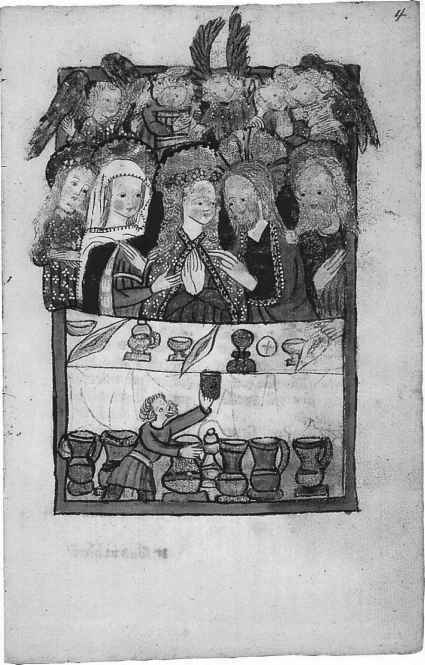 While community of goods was practised for a time in the early days of the original Christian church in Jerusalem, the giving of one's possessions to the common store was voluntary and not compulsory, and from the very beginning private ownership of property seems to have been normal among Christians. In at least one place in the New Testament those who forbade Christians to marry and commanded them to abstain from some kinds of food were deemed untrue to the faith. While widows were accorded special recognition, no one was enrolled as such before sixty years of age and the younger widows were commanded to marry and rear children. However, long before monasticism, and, indeed, from the first days of the Church, fasting was an accepted discipline. Widows who did not remarry and who devoted themselves to prayer and the service of the Church became customary. Moreover, celibacy was early prized by the Church. The Shepherd of Hermas held that while it was not wrong for Christian widows or widowers to remarry, they would "gain greater honour and glory of the Lord" if they refrained from doing so. As we have seen, the Marcionites forbade marriage. While the Catholic Church did not have that requirement for membership, in 305 a synod in Elvira, in Spain, demanded celibacy of the bishops and other clergy. Even earlier the custom had been established that a bishop, a priest, or a deacon should not marry if he had been unmarried before his ordination, and that if his wife died there was to be no remarriage. The official decrees of synods, councils, and Popes enjoining celibacy on the clergy seem to have arisen out of a growing custom and to have reinforced it rather than to have initiated it. Gradually the tradition was developing which was later to become fixed, in the West for the celibacy of deacons, priests, and bishops, and in the East celibacy for the bishops, but marriage before ordination for deacons and priests. In 385 Pope Siricius enjoined chastity upon all priests, saying that their daily offering of the sacrifice of the Eucharist made this necessary. In 390 a council at Carthage commanded chastity for bishops, priests, and deacons. Not far from the middle of the fifth century Pope Leo the Great extended to subdeacons the rule of clerical celibacy. In the second half of the fourth century a council in the East condemned those who regarded as unlawful receiving the Eucharist from the hands of a married priest. Late in the seventh century, in 692, a coun cil which was esteemed ecumenical by the Eastern but not by the Western section of the Catholic Church declared that any who wished might be married before ordination as subdeacon, deacon, or priest, but no one should do so after ordination, and a married man who was raised to the episcopate must separate from his wife and provide for her in a monastery.